Ready to learn more about the world's most unique floating campus? 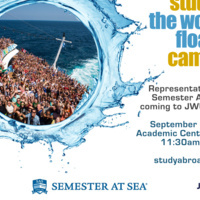 In partnership with OneJWU Week, Semester at Sea will visit the Denver Campus on Monday, 9/11 from 11:30am-2pm. Come join us at the Academic Center Atrium to meet with a Semester at Sea representative!